Manav Foundation is known for its phychosocial support being offered to adults to recover from mental diseases. It runs a day care centre in Mumbai which focuses on reintegration of adults with mental illnesses. Manav is a well-known name among doctors and psychologists, who often recommend their patients to Manav for regular care and counselling. The organisation conducts its daily programmes in a disciplined manner. Patients have a fixed daily schedule to follow at the day care centre. Daily living skills are taught; counselling is provided; beneficiaries are trained in different vocations under the project ‘Swayam’; and regular sessions on current affairs are held to boost their confidence. Animal Assisted Therapy, a very effective treatment method, is used to improve a patient’s social, emotional and cognitive functioning. The treatment requires patients to spend time with pet animals. Manav has partnered with Animal Angel Foundation for this treatment. Manav has a robust mechanism to track the progress of its beneficiaries. Assessments are done every three months by a senior counsellor and every 15 days by a social worker, who is also a qualified counsellor. Manav offers concessional treatment to economically disadvantaged individuals. Manav also offers an eight week internship to partially/fully recovered patients desirous of working with corporates. 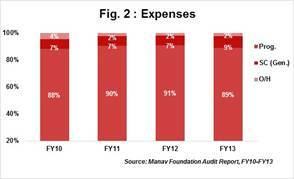 Total Income: Manav’s total income plunged significantly by 45% in FY13. This is owing to decline observed in donations received from individual donors. 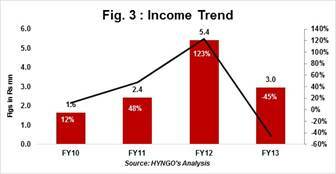 The total income for FY13 stood at Rs2.96mn v/s Rs5.43mn in the immediate preceding year. Service Charges & Sales Income: Manav charges a nominal fee of Rs3,000 per beneficiary per month for availing its support services. These service charges are either offered at a discounted rate or waived entirely for individuals who cannot afford it. Income earned from service charges increased on a Y-o-Y basis by 25% in FY13. In addition to this, Manav also runs a separate division that designs and manufactures trendy handbags and purses. Manav frequently participates in exhibitions hosted by corporates like Axis Bank, Nokia and others. They had also participated in Kala Ghoda Art Festival for 4 years. 4% of total income in FY13 was earned through this vertical. Direct Programme Expenses: During FY13, about 89% of total expenses was spent towards extending medical and counselling support to beneficiaries. The overall spend on beneficiaries declined from 91% in the previous year. It may also be noted that the NGO has not reported breakup of expenses spent towards the objects of the trust, so details of staff expenses or travel costs are unavailable. Income Growth Rate (IGR): Income Growth Rate is the Y-o-Y increase/decrease in total income. Manav posted disappointing IGR of negative 45% in FY13. This was owing to drop in income received from individual donors in FY13. Income CAGR for 4 years i.e. during FY10-FY13 was 22%. Self-Sufficiency Ratio (SSR): SSR indicates an organisation’s ability to meet its operating expenses from its own income. Own income include donations from individual sources, interest income, sale proceeds, service charges etc. Manav’s SSR declined to 61.5% in FY13 from a 4-Year high of 95% in the previous year. The steep fall in SSR can be attributed to a 45% Y-o-Y drop in total income in FY13. Dependency Ratio (DR): DR explains an organisation’s level of dependency on a particular income source over all other income sources. Manav is highly dependent on individual donors to satisfy its project requirements. 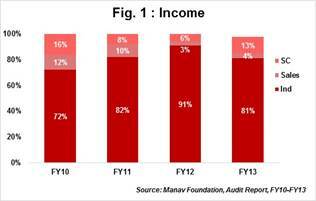 Its dependence on individual donations was 81% in FY13 v/s sector average of 33% for the same period. The average dependence on individual donors for the period FY10-FY13 was 82%. Manav will have to diversify its income sources to reduce vulnerabilty arising on account of excessive dependence on one particular source. Manav is 10-years old and additional income sources will help it sustain longer. High Counsellor Beneficiary Ratio: Due to lack of funds, Manav cannot afford to employ large number of counsellors. It currently employs only 3 counsellors who cater to 20-25 regular patients. However, there are many patients (not registered for Manav’s programmes) who visit their day care centre on an irregular basis. In such a situation, the counsellor-beneficiary ratio rises to an undesirable ratio of 1:16 i.e. one counsellor attending to 16 patients v/s an ideal ratio of 1:5. Space Constraint: Manav shifted to another location around March/April 2014. This is the third time they had to relocate since their inception. Frequent relocation has disrupted their work and relationships with the local patients. The current location accommodates only 20-25 patients, whereas they need to cater to 40-45 people daily. They need about 4,000 sq ft of space to to carry out their activities comfortably. The organisation is looking for a permanent centre to offer day-care services. Lack of Donor Interest: Donors, particularly institutional donors often lack interest in supporting mentally challenged individuals. Common reasons for their unwillingness to support this cause are a) slow recovery of a beneficiary b) uncertainty about positive outcomes and c) inability to quantify the progress made. Manav requires institutional donors to extend their support to this often neglected segment of our society. Mrs. Meena Mutha, Founder is actively involved in the operations of Manav Foundation since inception. She has made remarkable contributions to help beneficiaries at Manav Foundation recover from Mental Illnesses. Besides her, Ms. Binaifer Jesia has spent nearly 9 years in counseling patients with emotional and mental disturbances. She is a Director with Manav Foundation and is an equally active member of the team. The Board comprises 4 trustees of which 2 are related to each other. Directors/Trustees do meet up as needed but not as regularly as desired. As the organisation is grappling with macro issues on programme execution front, the team has not been able to spend adequate time to improve their systems and processes on the administration front. In the midst of relocating, Manav has not yet been able to streamline its documentation process. Manav is listed with GiveIndia, GuideStar India, United Way of Mumbai and Samhita. Build additional sources of funding: In order to ease the prevailing financial crunch, it is essential that Manav identifies additional sources of funding. Foreign donations could be one source. Manav should consider applying for FCRA which will allow them to raise funds from offshore donors. NGOs registered with HelpYourNGO under the disability space have received 32% of income from foreign sources on an average during FY13. Another source can be Government bodies. The process of receiving grants from Government agencies could be time-consuming, but is certainly worth exploring! Activate role of trustees: Manav can consider inducting more trustees on its Board who are well connected with the donor fraternity. By doing this, the organisation may be able to attract more donors to support its projects and help to long term continuity. Manav could derive more from its board members by meeting them formally once a quarter, rather than having ad-hoc meetings.